I learned four things in today's stretch. I will list them in order of growing incredulation. Fergie Jenkins is Canadian and has a stamp. His mother's family came to Canada on the underground railroad? He played for the Harlem Globetrotters?!? The Cubs CAN hit with runners in scoring position!?!? 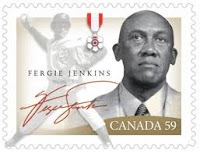 Fergie's song itself was well sung but in stumbling around some of the words, it almost seemed like he didn't know this canon of Cubs lore by heart - as if he were a Canadian tasked with singing the American national anthem. Fergie pronounced "Cubbies" like "Cu-Hubbies." It threw me off. After the song, he pleaded "Come on guys, let's get motivated here! Let's get motivated! Score some runs! Let's Go!" This double call to get motivated seemed a bit needy but the guilt trip by a Cub HOF-er (and the only Canadian in the HOF) seemed to work. The Cubs ripped off 5 runs in the 8th with timely walks and doubles and earned their first win. We'll see if the guilt trip works in the future but for now we'll list it as "known to be effective" and worth at least 2-4 late runs. Side note - Apparently today was the 8th anniversary of Ron Santo accidentally catching his hairpiece on fire while leaning too close to a heater in the booth during the national anthem. Ironically, Al Leiter was pitching against the Cubs that night. Pat Hughes ended the tale with "... could have happened to anybody ..."
Highly inaccurate and also hilarious.